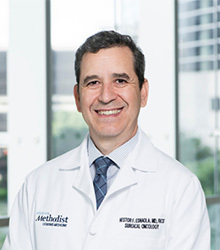 Dr. Nestor Esnaola is division head of surgical oncology, Department of Surgery, Surgical Director, and Cancer Center Associate Director, Cancer Control and Population Science. Dr. Esnaola will lead cancer center efforts in the areas of cancer prevention, community outreach and engagement, cancer health disparities, and population science research in accordance with NCI cancer center guidelines. Does the Surgical Apgar Score predict serious complications after elective major cancer surgery? Surgical Management of Pancreatic Neoplasms: What’s New? Selander, C, Pullatt, R, Esnaola, NF & Camp, ER 2013, American Surgeon, vol. 79, no. 2.